This simple recipe for Sweet and Spicy Crockpot Chicken combines sweet and sour sauce, barbecue sauce, and chicken in a five ingredient recipe with a fabulous flavor. The chicken becomes meltingly tender when cooked in a slow cooker. You can add any other vegetable to this recipe; I added a chopped green bell pepper the last time I made it. A combination of different colored peppers would be wonderful in this dish. Sliced carrots, zucchini, or any Asian vegetable would be delicious too. The nice thing about cooking recipes like this one is that they are very tolerant. That means you can change things around and the recipe will still work. But be careful to follow the proportions of the basic recipe. If you add a lot of other ingredients, you'll need to increase the sauce amounts too. This recipe can be as mild or as spicy as you'd like. If you like it mild, use a mild barbecue sauce. Make sure that you taste the barbecue sauce and sweet and sour sauce before you use it so you know that you like the flavors. If you like food spicy, use a spicy barbecue sauce, and add some minced jalapeño or habanero peppers to the crockpot. You can also add crushed red pepper flakes or cayenne pepper. Use as much or as little as you like. Serve this easy recipe over hot cooked rice or hot cooked pasta. To complement the flavors of the dish, add a mild green salad or a fresh fruit salad for a cooling contrast. For dessert, something light is nice. An ice cream pie or a fruit dessert would be perfect. 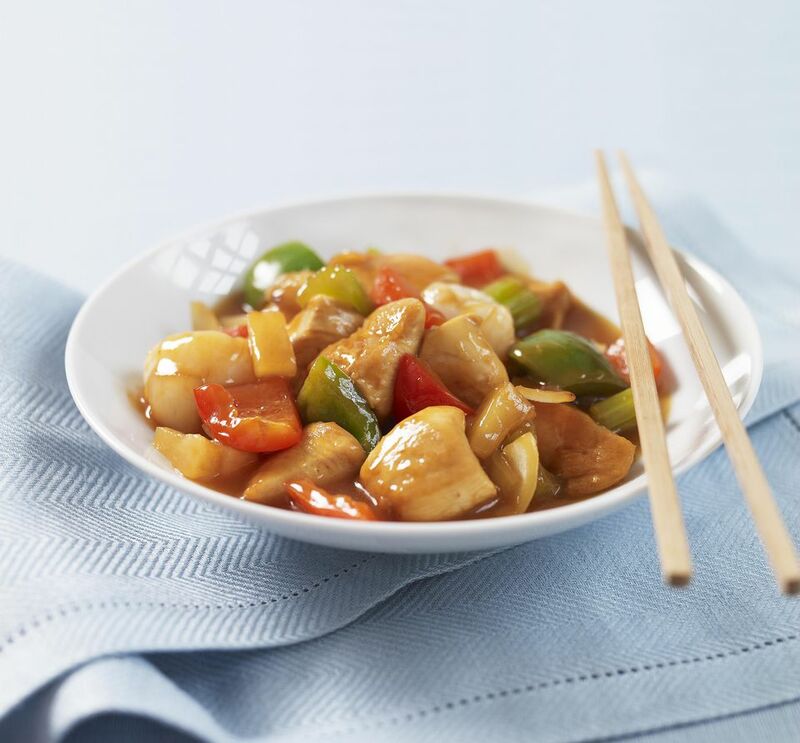 Combine the chicken, garlic, onion, sweet and sour sauce, and barbecue sauce in a 3 to 4 quart slow cooker and stir gently. Cover the slow cooker and cook on low for 7-9 hours until chicken is thoroughly cooked to 165°F. If you'd like a thicker sauce, mix the cornstarch and water in a small bowl and add to the liquid in the crockpot; cover and cook 10-15 minutes until thickened. Serve over hot cooked rice or couscous. Note: Remember, if you have a newer crockpot that cooks hotter, check the chicken at 6 or 7 hours. If your food burns, it was cooked too long. You must know if your crockpot cooks ​hotter before you start cooking.